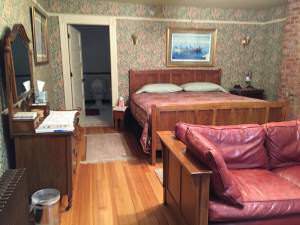 Claim "Alaska’s Capital Inn Bed and Breakfast"
Stay in one of America’s historic Gold Era mansions that has been restored with contemporary furnishings, and is across the street from the Alaska State Capital building. Rooms feature free Wi-Fi and a flat-screen cable TV. Bath robes and slippers are provided in each room at Alaska’s Capital Inn Bed and Breakfast for guest comfort. The uniquely furnished rooms are also soundproof for maximum privacy. The daily hot breakfast available at the Bed and Breakfast Alaska Capital offers items such as crab eggs benedict, Alaskan sourdough pancakes, and smoked bacon. Granola, Juice, tea, and muffins are also provided.